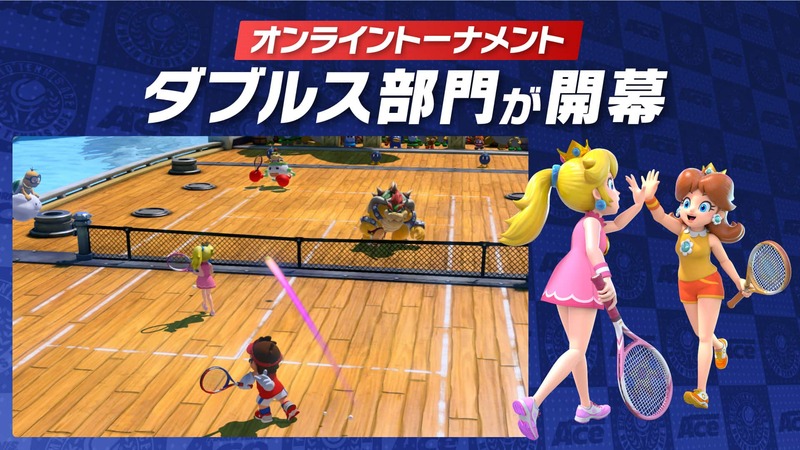 Last week, during the Nintendo Live 2018 event in Kyoto, Nintendo made some announcements regarding Mario Tennis Aces. The game is getting a new Software update on December 1st (effectively November 30th for North America), and it will bring some major changes to Online Tournaments (check out this page for the full official patch notes). Also, the update will introduce a ranking system to Online Tournaments. Depending on your performance, you will be assigned one of the following ranks: S, A, B, or C. Then, when taking part in Online Tournaments, you will be matched with players with a rank as close to yours as possible. Of course, that also applies to Doubles, as mentioned above. But that’s not all: even more changes are coming to Online Tournament on December 1st. Make sure to check out the full official patch notes for the update for more details! 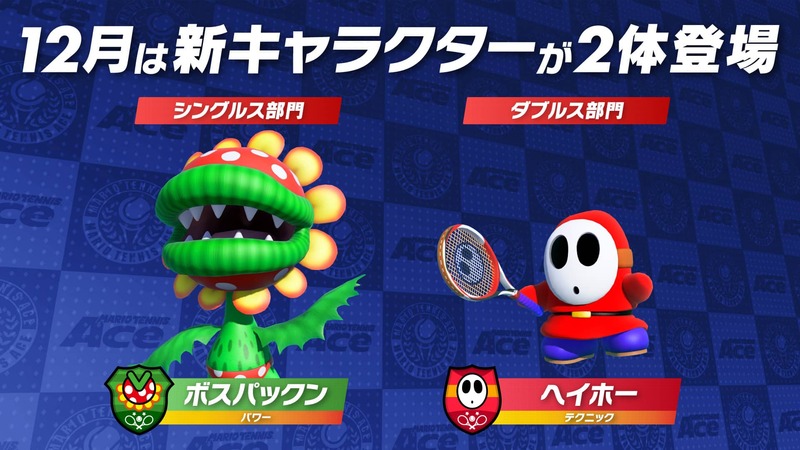 In order to celebrate the addition of Doubles to Online Tournaments, not one but two new characters will be added at once to Mario Tennis Aces in December: Petey Piranha (Power), and Shy Guy (Technical). As usual, they will be available exclusively for players taking part in the Online Tournament at first, but they will then be unlocked for everyone in January. 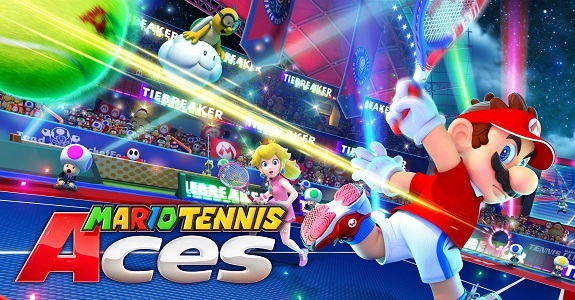 Also, the second co-op mission for Mario Tennis Aces has been announced! It’s called Yoshi’s Ring Shot, and it will run from December 1st (when the update is released) to January 10th. It uses button controls and standard rules, and requires a team of 4 players. You can play either with complete strangers online, or with friends (if you have 4 controllers, you can all play on the same Nintendo Switch console). If you manage to reach the objectives, you can get Yoshis of different colours: blue, red, and yellow. 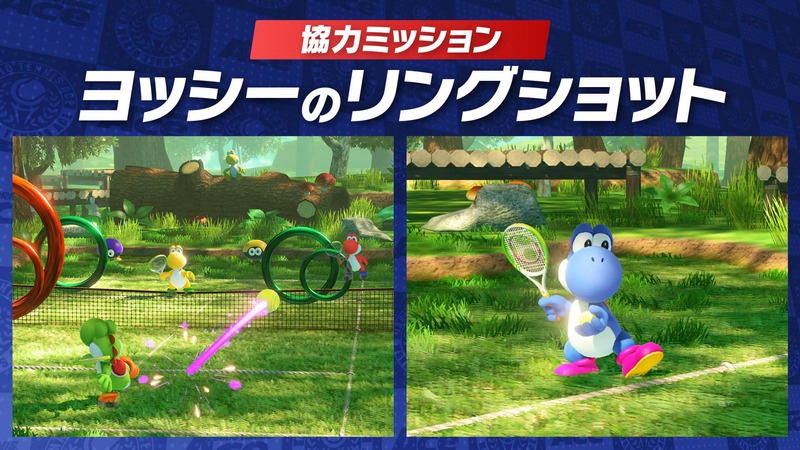 There’s also a Yoshi of a different colour that only the player who achieves the objective can get! Finally, 3 new characters were revealed: Luma, Pauline, and Boom Boom. All three characters will be available via online tournaments from January to March, and will become available to all players the following months (February, March, and April).